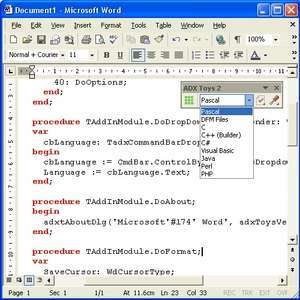 Add-in Express Toys .NET is a free Word COM add-in / plugin that adds several useful features to MS Word. This sample addin is based on Add-in Express for Office and .NET Edition and gives you an example of how to create Microsoft Word COM add-ins, how to manage add-in toolbars and controls, and how to get access to Word objects. For security reasons, you should also check out the ADX Toys 2 WD download at LO4D.com which includes virus and malware tests. Additional screenshots of this application download may be available, too.